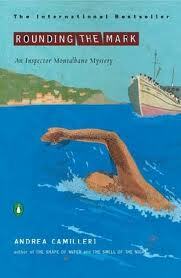 Continuing the Salvo Montalbano series in order, Rounding the Mark is number seven, leaving me six more to go. Five if you don't count the newest one, The Potter's Field, which won't get here until September. It's not a good night for Montalbano. He is unable to sleep, and even more telling, unable to eat. He's decided to turn in his resignation, feeling betrayed by the news about a raid on the Diaz School in Genoa during the G8 meetings there, in which evidence had been found to be planted, the stabbing of a policeman by an "antiglobalist" had been discovered to have been self inflicted, and that ultimately there was no legitimate reason that the raid needed to have taken place. As he often does when he's restless, he decides to take a naked swim in the ocean in the early morning hours. As he turns on his back and does a stroke, he bumps into something that turns out to be a foot. He apologizes to the unseen person, only to discover that it is really a corpse. Some days later, he goes to deliver a pair of glasses to a cop friend at the scene of the landing of illegal immigrants, when a little boy runs off the boat and away from everyone. Montalbano goes after him, captures him and delivers him to his mother. But he can't help but notice that the boy looks petrified and is highly agitated. After some time, the boy's body is later discovered -- someone has hit him with a car and killed him. Wondering if perhaps his own actions were linked to the boy's death, he begins investigating and will not let up until he finds out the truth. Despite Montalbano's disgust at his government, the corrupt policemen and his ongoing battle with what he feels might be old age creeping up on him, there are some really funny episodes that made me laugh out loud. First, Salvo's naked "rescue" of the corpse is caught on television. Then there's an ongoing gag about a cop named Torretta, who seems to have opened an "emporium" in the station, always ready with anything that anyone could possibly need. Catarella's mangling of Italian leads Montalbano to a vital clue through someone Catarella insists is named Pontius Pilate. But there is nothing funny at all about the way Camilleri depicts an ongoing and growing problem in Italy, one that is shared by many countries around the world. Here we find Montalbano at his most intense so far, and although the overall mystery wasn't as satisfying as it might have been, it was still quite good; it is yet another excellent entry in the series. Camilleri's regular characters are so well developed and well portrayed that I feel like I know these people well by this point, yet I'm always surprised by the twists and turns in Montalbano's life. Even though at times these books become formulaic and often rely on odd coincidences, and although these traits are not ones I particularly care for in any mystery or crime fiction novel, Camilleri's writing keeps me reading. It's easy to overlook the flaws because I'm having such a great time reading. I'm reading The Snack Thief now. Although it's not perfect, it's a lot of fun, easy reading and humorous. Very good for relaxing and diversion, and one feels nary a care while reading about Montalbano, his idiosyncratic colleagues and their exploits. Some books in the series are better than others, but they are all entertaining and provide a way to tune out and enjoy the crazed turns of events in Vigata. Stephen Sarterelli's translations and end notes are a joy. Dorte: I hear you, and the reason I'm reading through the series right now is to get to Wings of the Sphinx, which is on the CWA International Dagger Shortlist. Last year I read August Heat out of sequence (actually, before I'd read any Camilleri novel at all) and felt totally lost. This time around, I'm playing catchup. And I have a huge TBR pile of crime fiction to get to when the shortlist reading is all over. Kathy D: The Montalbano books, as I've said somewhere else here, fall (imho) on the "crime light" side of my normal reading, and I have to say that aside from staying with them to get through the series in order, I really enjoy Montalbano's character. Even though the stories are entertaining, I come back for more basically for Montalbano. He's an awesome character, one I'll miss when it's all over.